Whether you are travelling within or across the state coaches are often an efficient way of getting to your destination without breaking the bank. Zeelo coaches have tons of legroom, wide reclining seats, and all the trim, but even with all these, achieving a good night’s sleep on the road will depend on your sleeping habits and position. Needless to say, if you want to get some sleep, try and relax your mind, tone down your music volume, switch off your phone, stop eating, get cozy and you will be snoozing even before you hit the highway. This is hands down the easiest way and arguably the most comfortable position you can achieve on a bus. If you happen to have the window seat, you can recline your seat and tilt your body facing the window, get cozy and you be off to slumberland in no time. If you are lucky enough to have the neighbouring seat(s) to yourself, there are a myriad of sleeping positions you can try out. One can sleep sideways with no support on the head or feet. Alternatively, you can have your legs drape off the other seat on the edge depending on your height. This sleeping position is best for passengers who managed to get the aisle seat. Snuggle into your seat and have your legs hang over the armrest with your back against the nearby passenger. This position is good if you intend to block an annoying travel mate. You could opt to go old school by simply putting your head up and reclining the seat if possible for a nap when you are lumbered with the middle seat of a 3-seat row. Some coach hire has headrests that can be modified to offer extra support, but any travelling maestro will have a neck pillow to help in getting that extra comfort. Travelling is a great way of meeting new people and once you get the acquaintance of your new neighbour, you can turn their shoulder into a headrest. This position is fairly comfortable, but you might want to change it every 30 -45 minutes as failure to do so might cause cramps on the other side on your neck. Do remember to ask before you get too close and personal though. This sleep variation position offers a secure fit and allows you to face forward and rest your knees on the back of the seat in front of you. This position is comfortable on bumpy roads but you should be careful not to shift your weight very often, as it can be a nuisance to the passenger in front. If your body size allows it, you can curl yourself into a fetal position. This position can be more comfortable if you place a bag on your lap in order to get a raised headrest. This can turn out to be both the best and the worst sleeping position. This involves sleeping on your neighbour’s lap but then you ought to obtain consent first. The head banger can be very bad if your ride is bumpy but on the flip side, a cozy neighbour will make your journey comfortable. Like the curl up position above, having a bag as a pillow will make the experience a lot better. This is a cozy position that won’t get you worried about cricks and pains the next day. You have to lean your head in between the perpendicular walls of the window and seat to get some sleep. 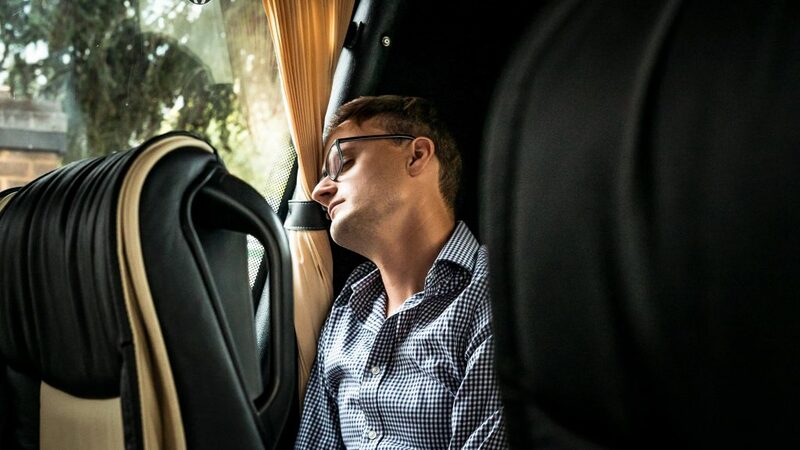 Not all buses have reclining seats and if you happen to be onboard one, it can be difficult to attain a good sleeping position. To achieve this comfortable sleeping position, sit halfway on your seat stretch out your legs an uncross them to avoid blood clot and lean back. Wake up and rotate every 45 minutes to avoid cricks.